The public is invited to a reception for Shoreline Deputy Mayor Jesse Salomon who is retiring from the Shoreline City Council to assume his new duties as State Senator for the 32nd Legislative District. 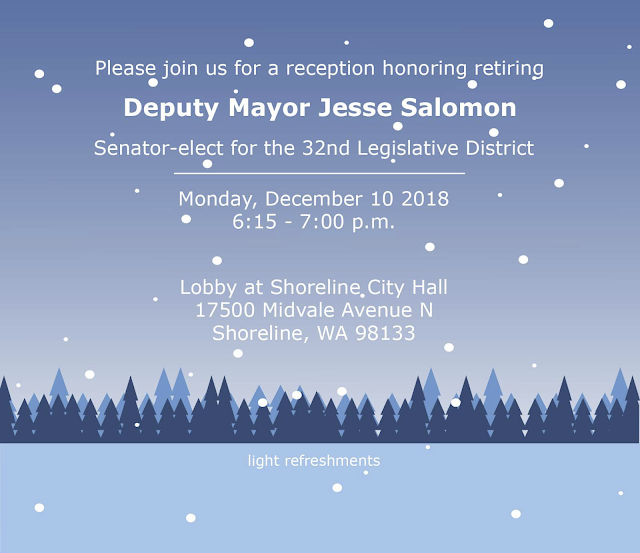 The reception will be held on Monday, December 10, 2018 from 6:15 to 7pm in the lobby at Shoreline City Hall, 17500 Midvale Ave N, 98133. "Retiring" does not equal "resigning." Salomon is not retiring, he is resigning.